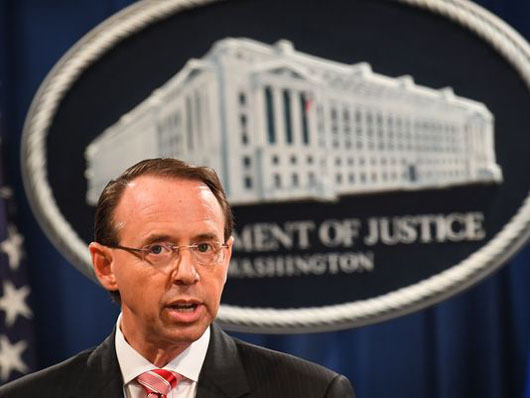 Three days before the Trump-Putin summit in Helskinki, U.S. Deputy Attorney General Rod Rosenstein last week announced grand jury indictments of 12 Russian intelligence officers in special counsel Robert Mueller’s Russia investigation. And “there is absolutely no chance any of the Russian officials charged will ever see the inside of an American courtroom,” former Assistant U.S. Attorney Andrew McCarthy wrote for National Review on July 16. But that “wasn’t Mueller and Rosenstein’s intent,” Babbin noted. “By timing the indictments on the last business day before the Trump-Putin meeting, these indictments were much more than a publicity stunt. They were an improper attempt to influence what Trump does at the summit. The only known allegations of such crimes are contained in the unverified, Clinton-campaign-sponsored dossier by ex-British spy Christopher Steele, “and the Trump-campaign figures implicated in it have either not been charged at all (e.g., Carter Page, Michael Cohen), or not been charged with a “collusion” crime (Paul Manafort),” McCarthy noted. Babbin concluded: “In the late 18thcentury, Russian Field Marshall Grigory Potemkin, then the most powerful man in Russia, supposedly had constructed several phony villages along the path that his lover, Empress Catherine, would follow in her tour of southern provinces so she could see contented, happy peasants when nearly the entire population of Russia lived in misery and slavery. His name became synonymous with falsity.